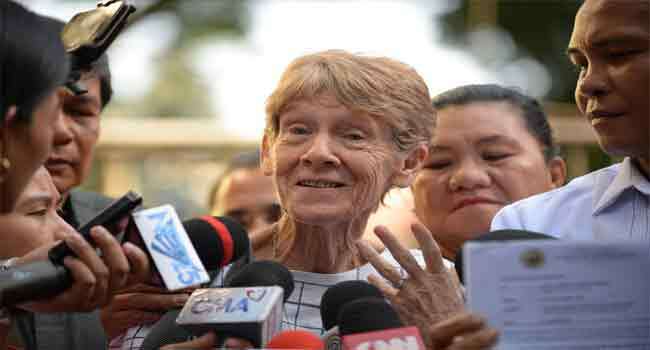 Sister Patricia Fox, 71, who was briefly detained last week, will be the second foreigner who has spoken out recently against Duterte’s policies to be expelled, as the government hits back at critics of his human rights record. “We direct Fox to leave the Philippines within 30 days from receipt of this order,” it said in a statement, adding that the nun had “engaged in activities that are not allowed under the terms and conditions of her visa”. Fox said in a statement Wednesday she helped to train Filipino farmers and tribesmen in organic farming to improve their incomes, as well as “to advocate with them for their rights to land, livelihood, peace, justice and security”. Her lawyer Jobert Pahilga said the deportation order violated the nun’s right to due process, and she would appeal to have the immigration service ruling rescinded. “I ordered her to be investigated… for disorderly conduct,” Duterte said in a speech last week. Duterte has previously launched verbal attacks against critics of his government’s narcotics crackdown, which has killed thousands of alleged dealers and users. The International Criminal Court’s chief prosecutor launched a preliminary investigation in February into allegations of extrajudicial killings. Earlier this month Manila also deported Italian Giacomo Filibeck, deputy secretary general of the Party of European Socialists, who had previously condemned “extra-judicial killings” in Duterte’s anti-drug war.